Charlie Brown, Snoopy, Lucy, Linus and the rest of the “Peanuts” gang are gearing up for their big-screen debut in November and they’re making their grand entrance in state of the art 3D animation! Charlie Brown, the world’s most beloved underdog, embarks upon an epic and heroic quest, while his best pal, the lovable beagle Snoopy goes up against his nemesis the Red Baron. Meanwhile, Charlie Brown tries to win the affection of the Little Red-Haired Girl, who just moved to the neighborhood. Taken from the imagination of one of the mot influential cartoonists of all time, Charles M. Schulz, The Peanuts Movie will encourage your entire household to Dream Big. 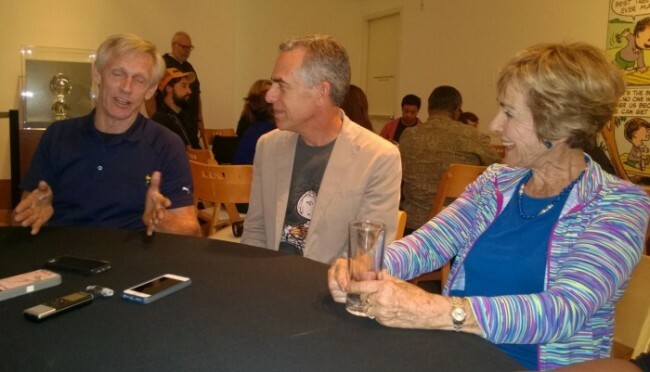 We were thrilled and grateful to participate in a special media day at the beautiful Charles M. Schulz Museum in Santa Rosa, CA and even more excited that we were able to chat with some of the filmmakers, writer/producer, Craig Schulz (Charles’ son); director, Steve Martino, and Jean Schulz (Charles’ widow) who, along with the rest of the family, helped keep the heart of Charles M. Schulz’s vision alive throughout the film. “Plainly it had to be written by the family because even people who loved the strip all want to distort it in their own image,” Jean Schulz shares with Tinseltown Mom. This highly anticipated film includes four generations: the mastermind creator, Charles M. Schulz, his son Craig, his grandson Bryan Schulz, who was also a writer/producer on the film and Charles’ great-grandson, Micah, who voiced one of the characters. Many of us grew up adoring Peanuts, and it’s hard to believe that it’s been 35 years since the last movie was made and that this will be the film’s big-screen debut. “The last movie we did was 1980, Bon Voyage, Charlie Brown (and Don’t Come Back!!)... The reason we brought it back was it had been about twelve or thirteen years since my dad had passed on and the new generation was coming up, no one was reading newspapers anymore… so we had to find some way to reach new audiences and bring them back to Peanuts and hopefully the movie will do that. You’ll watch the movie and wonder about Charlie Brown and Snoopy and wonder who that dirty Pig-Pen kid is and if you go back and read the comic strip you’ll understand who Pig-Pen is and Violet and Patty. That’s what our hope is; that it’ll drive you back to the books and not the other way around,” Craig explains. Knowing what an important franchise the Peanuts strip was, and still is, we also wondered how the family came up with the crucial players. “…I got with my son, who just graduated from film school and sold a couple of movies… and Cornelius Uliano, his writing partner, and the three of us sat down and crafted the film and then we decided who can make it and we went to Blue Sky and Steve (Martino) and said ‘can you make our movie?’ and we built our team around that and now here we are,” Craig says. 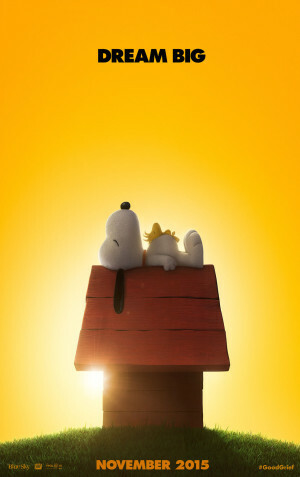 The characters, as well as the authenticity of the original comic strip, are genuine to the brilliance of Charles M. Schulz, however there were some enhancements that will make the movie even more appealing to wider audiences, like the “intentional and important” computerized 3D animation that allows for a richer feel and more believable world. The Peanuts Movie is scheduled to be released on November 6, 2015. I’m so excited to see this it looks awesome! My daughter and I are so excited for this movie! I loved Snoopy growing up and I’m glad I get to share Snoopy with her! I’m so excited! What a fun interview. It looks like it is going to be really cute and fun. Brings back so many memories. My nieces are really going to love it. Oh I can’t wait to see this! I loved Snoopy! How exciting, I had no idea there was going to be a Peanuts movie! Family date night! Thanks for sharing! oh I can not wait! I love the peanuts gang, I am so super excited to see them in 3D! Awesome interview. Looking forward to the movie! This looks like such a fun movie. My husband and I will be excited to take our kids to see this one! I and my little one will have a date lunch along with this movie. Feeling excited. Can’t wait for the movie to come out. Peanuts was and is my ultimate cartoon strip! I didn’t even know a movie was coming out! I must’ve been under a rock. Such a cool experience, thanks for sharing!